Draining the West side of the Greenland Ice Sheet just north of Disko Island, Umiamako Glacier unlike most of the others in the region reaches close to the end of its fjord. The glacier flows 50 km down this fjord, though in the last 10 years this distance has decline sharply. 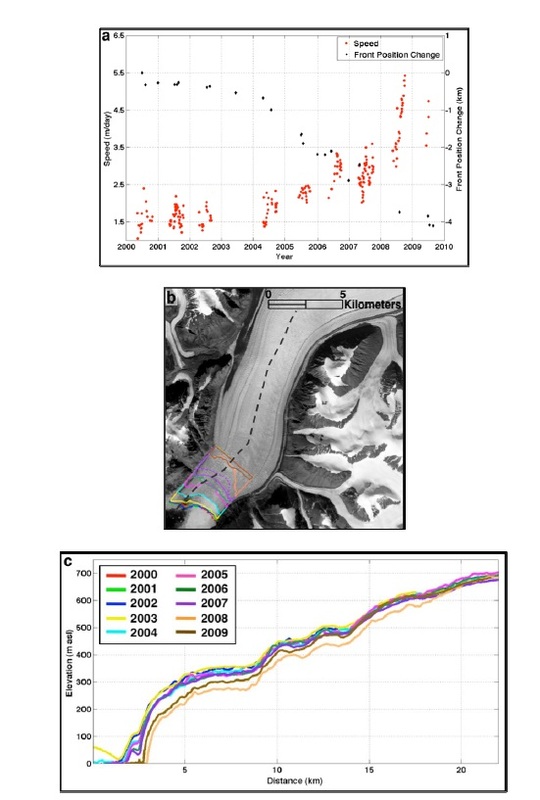 A recent paper by McFadden et al (2011) explores the dynamic changes of this glacier. The glacier was first chosen for examination in the late 1930’s by the British West Greenland Expedition. The first good data on velocity come from the survey of Carbonell and Bauer in 1964, who reported a velocity of 1200-1900 meters per year. The terminus and the velocity of the glacier both were pretty stable for the next 40 years, much as was the case on the Jakobshavn to the south. In the McFadden et al (2011) paper the velocity is still in the same range of 1500 meters per year until 2005, top box in image below. From 2005 to 2009 the velocity increased to 5000 meters per year. The associated retreat is in the middle box of this image. 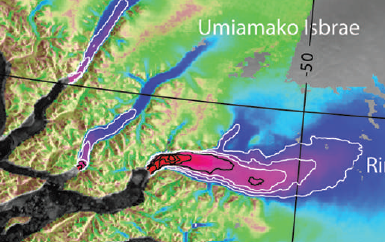 The extent of the acceleration inland is not identified here directly, but in the surface profiles the bottom of the three boxes in the McFadden image, the inland thinning in 2008 is significant to 20 km inland, suggesting an acceleration to here. 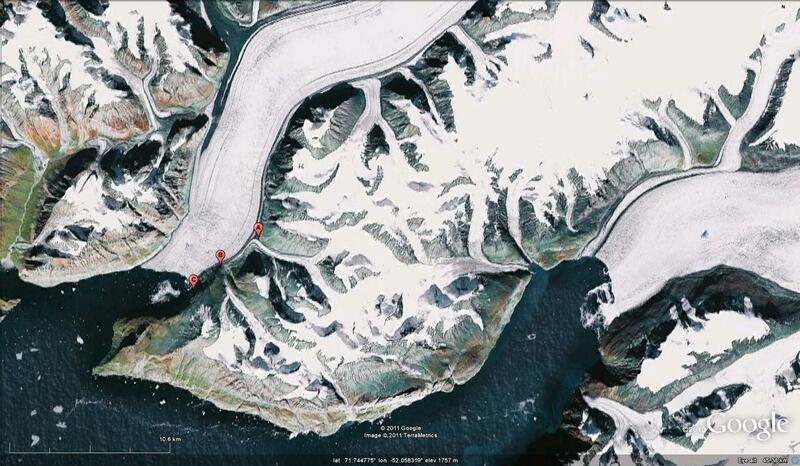 The fjord reach of the glacier still extends another 25-30 km, so the acceleration has not reached to the inland ice. In the Joughin et al (2010), second figure below,the extent of high velocity is quite limited for Umiamako compared to Rinks just to the south inn 2005/06. Is this still true? After the retreat of 2003-2005 the acceleration began. 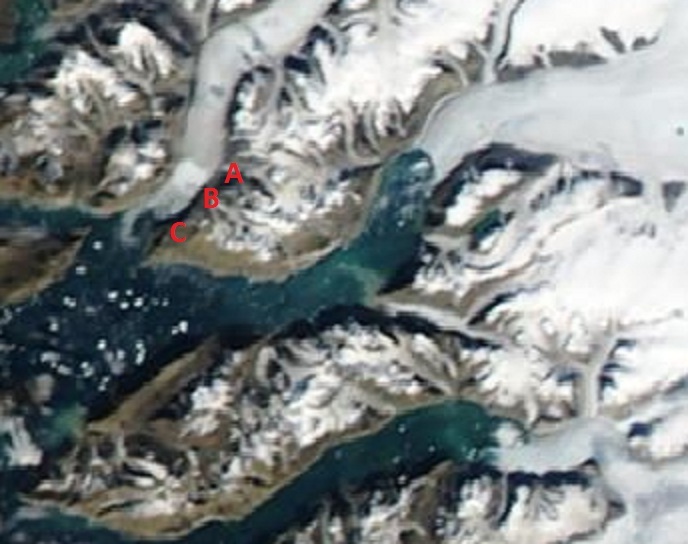 This is typical for the marine terminating outlet glaciers as thinning usually leads to retreat and the thinning leads to decoupling of the glacier to extent from the fjord walls and its bed. This typifies the third type of Greenland glaciers reviewed by Bailey and Pelto (2011). The reduced frictional forces lead to acceleration and further retreat. 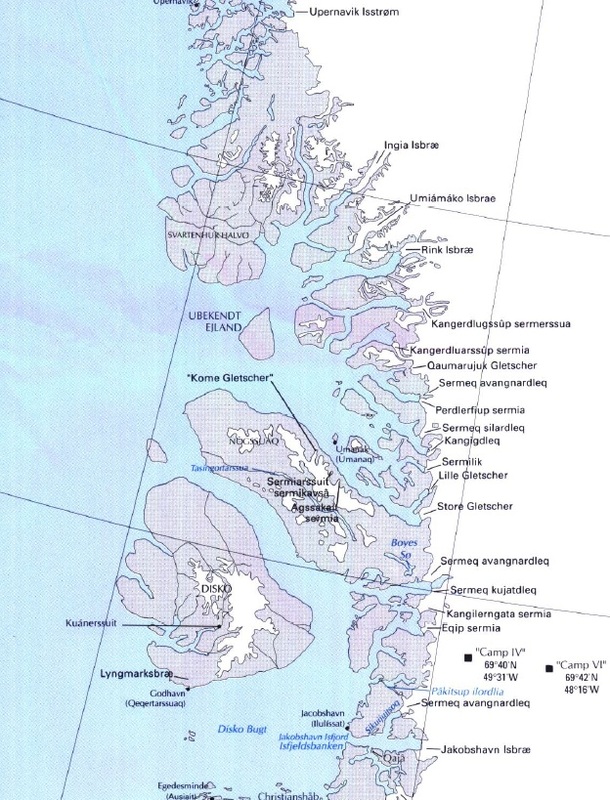 In this case the fjord is longer than many in the sector of West Greenland, leading to a smaller area of contribution from the inland ice and less capability to drawdown this ice. The terminus change can be seen in the map from McFadden , but also in the three images below, first from Google Earth in 2004( top image), than from MODIS in 2010 (middle image)and 2011(bottom image). C marks the terminus position, B the juncture with the first southerly tributary glacier and A the juncture with the second tributary glacier. 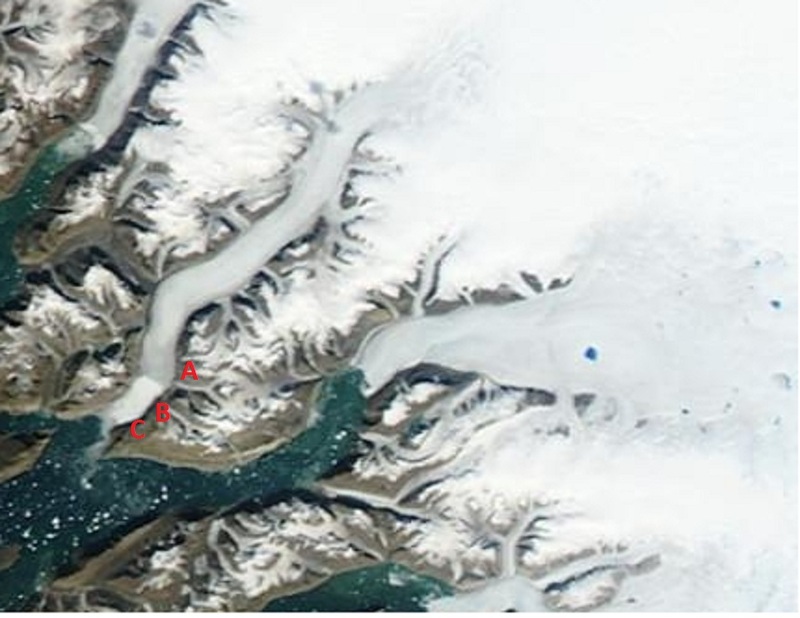 The two tributary glaciers that clearly feed the glacier in 2004, B now enters the fjord below the glacier and A is right at the terminus. In the McFadden image the 2009 terminus is still downstream of tributary A. Total retreat in the last decade is at least 7.5 km. Extreme Ice Survey set up a camera at the terminus and has a time sequence from 2008, this same camera location in 2011 would show a much different scene as the glacier has retreated 2 kilometers.